Fifteen, twenty years ago while I was visiting my Grandfather Sidney Stumbo; our conversation was about family history. 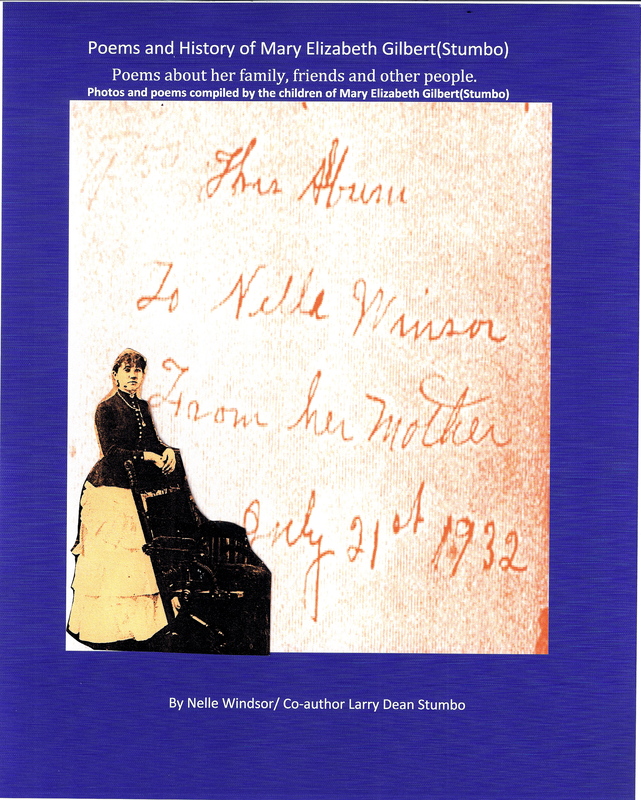 He got up and came back with two items, one of which was the album his sister Nelle Stumbo (Windsor) had placed together for him, containing the poems and photos from his mother, Mary Elizabeth Gilbert (Stumbo). As I looked through the album, I saw not only family history; poems that reflected the times when they were written, also poems that could be applied to most any time in history. I asked my grandfather if I could have the album copied and I would make copies for the Stumbo family reunion; I did and had several taken by family. I also included that I had permission to copy the album from granddad. I donated one to the Iowa Genealogical Society for reference at that time. Fast forward to the present; I felt that this album needed to be preserved in a more “permanent” presentation for anyone that was interested. At first I was going to retype all the poems and redo what had been already done, but with sharper text, photos and a book cover ready for the book shelf. Upon a suggestion from one of my daughters, I dropped that idea and scanned in all the pages and was able to sharpen the text, some photos and create the book cover with suggestions from author friends and family. As you can see this is what I came up with; with a little more help from someone else that was interested in saving the poems for “prosperity”.